You will need a roasting pan with a rack to keep the roast suspended. Add enough water in the bottom to cover it, but keep it below the rack. Add the two beef bouillon cubes, or the equivalent beef base to the water. The water will help keep the meat from drying while it cooks and will create a larger volume of stock to make gravy. Place the roast on the rack in the roasting pan, bone side down. Sprinkle desired amount of garlic, fresh ground pepper and any other seasonings that you wish to use. Then drizzle soy sauce over the top of the roast. Adding the soy sauce and any seasoning while the roast is over the water in the pan helps flavor the stock that you can use to make gravy. 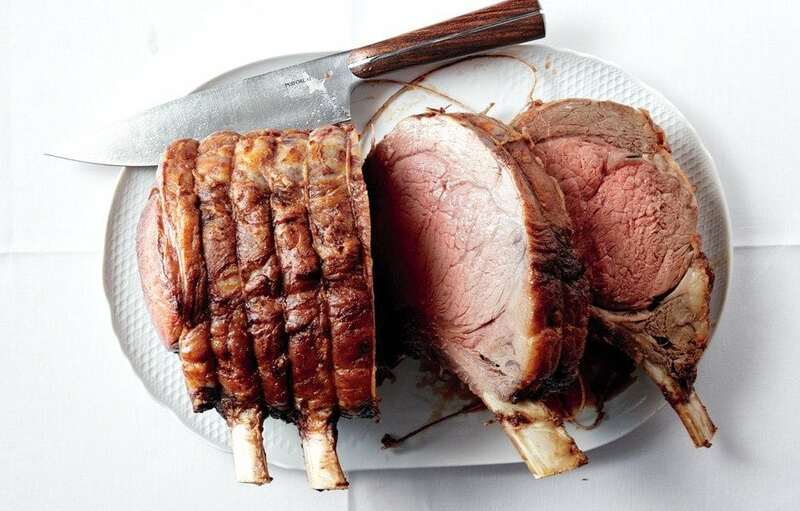 Place the roast in an oven that has been preheated to 325° and allow yourself at least 2 hrs cooking time. Grass-fed beef has a tendency to cook at a faster rate that normal beef, so don’t rely on cooking time per pound. You have to pay attention to the internal temperature. Allow roast to “rest” on the cutting board for about 8min. before slicing. This prevents the meat from drying out. Slice the roast between the bones, or make it boneless by cutting the meaty portion of the roast away from the bone before slicing. To make gravy simply add a flour and water slurry to the remaining stock and stir continuously until gravy comes to a boil. The gravy will not thicken to the fullest until it reaches a boil.